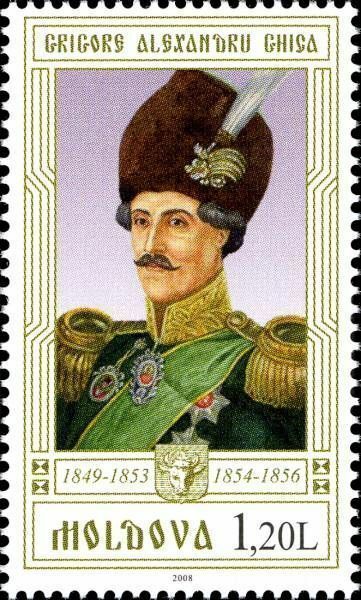 On 14 November 2008, the Post Office of Moldova (Poșta Moldovei) issued a series of postage stamps with the title Princes of Moldavia (VI). The issue comprises seven stamps, one on a souvenir sheet, with associated cancellation (postmark) and first day covers (FDC). The designer was Elena Karacenţev. The printing was performed by Tipografia Centrală, Chişinău. This article uses material from the Wikipedia article 'List_of_rulers_of_Moldavia', which is released under the Creative Commons Attribution-Share-Alike License 3.0. 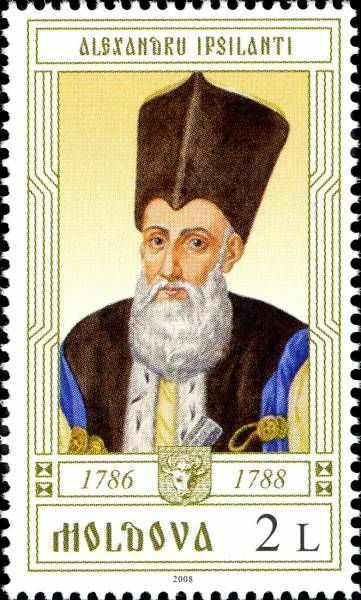 Michael Soutzos (Greek: Μιχαήλ Σούτζος, Romanian: Mihail Suţu, Constantinople, 1784 – Athens, 12 June 1864 ), was a member of the Soutzos family of Phanariotes, he was the nephew of Mihai Suţu; he was in turn a Prince of Moldavia, between 12 June 1819 and 29 March 1821. Read more.. This article uses material from the Wikipedia article 'Michael_Soutzos', which is released under the Creative Commons Attribution-Share-Alike License 3.0. 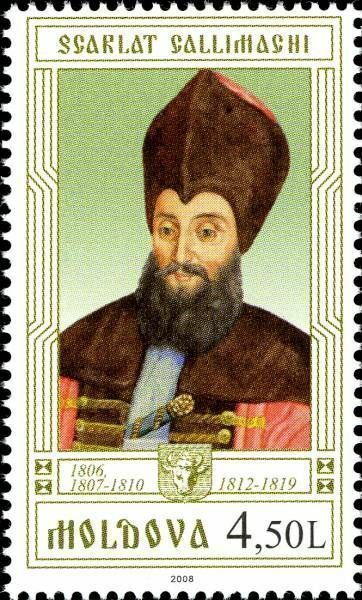 Grigore Alexandru Ghica or Ghika (1803 or 1807 – August 24, 1857) was a Prince of Moldavia between October 14, 1849, and June 1853, and again between October 30, 1854, and June 3, 1856. 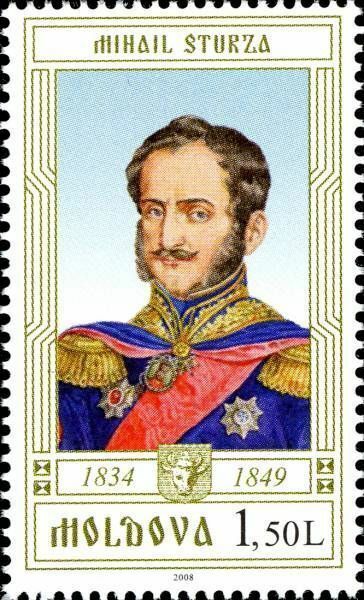 His wife was Helena, a member of the Sturdza family and daughter of Ioan Sturdza, who had been Prince of Moldavia from 1822 to 1828. Read more.. This article uses material from the Wikipedia article 'Grigore_Alexandru_Ghica', which is released under the Creative Commons Attribution-Share-Alike License 3.0. 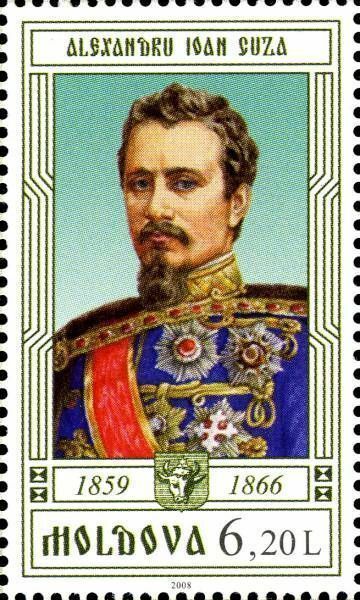 Mihail Sturdza (Greek: Μιχαήλ Στούρτζας; 1795, Iaşi – 8 May 1884, Paris) was prince of Moldavia from 1834 to 1849. Read more.. This article uses material from the Wikipedia article 'Mihail_Sturdza', which is released under the Creative Commons Attribution-Share-Alike License 3.0. Alexander Ypsilantis (Greek: Αλέξανδρος Υψηλάντης - Alexandros Ypsilantis, Romanian: Alexandru Ipsilanti; 1725–1805) was a Greek Voivode (Prince) of Wallachia from 1775 to 1782, and again from 1796 to 1797, and also Voivode (Prince) of Moldavia from 1786 to 1788. He bears the same name as, but should not be confused with, his grandson, the Greek War of Independence hero of the early 19th century. The Ypsilantis were a prominent family of Phanariotes. Read more.. This article uses material from the Wikipedia article 'Alexandru_Ipsilanti', which is released under the Creative Commons Attribution-Share-Alike License 3.0. 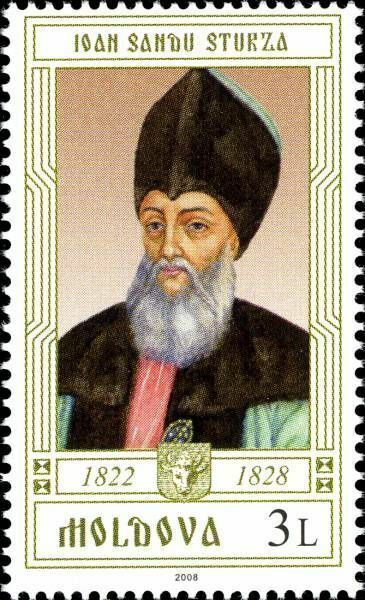 Ioan Sturdza (Ioan Sandu Sturdza or Ioniţă Sandu Sturdza; his first name may be given as John) was a Prince of Moldavia (June 21, 1822 – May 5, 1828). Read more.. This article uses material from the Wikipedia article 'Ioan_Sturdza', which is released under the Creative Commons Attribution-Share-Alike License 3.0. 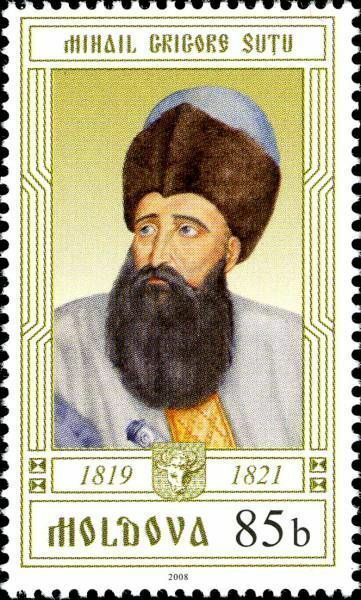 Scarlat Callimachi (Constantinople, 1773 – December 12, 1821, Klaudioupolis, Bithynia) was Grand Dragoman of the Sublime Porte 1801–1806, Prince of Moldavia between August 24, 1806 – October 26, 1806, August 4, 1807 – June 13, 1810, September 17, 1812 – June 1819 and Prince of Wallachia between February 1821 – June 1821. Read more.. This article uses material from the Wikipedia article 'Scarlat_Callimachi_%28hospodar%29', which is released under the Creative Commons Attribution-Share-Alike License 3.0. This article uses material from the Wikipedia article 'Alexandru_Ioan_Cuza', which is released under the Creative Commons Attribution-Share-Alike License 3.0.